Watch Batman Begins and The Dark Knight now. You too can earn money from writing articles by signing up for InfoBarrel. 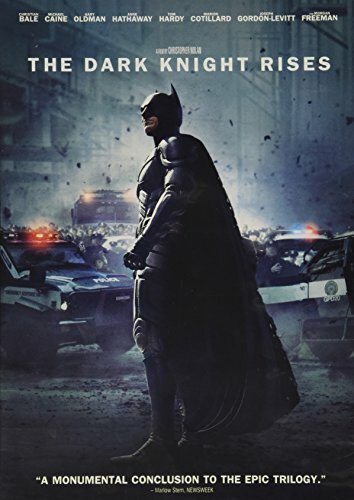 The Dark Knight Rises is the third, and final, film in the Batman trilogy starring Christian Bale (American Hustle) as Batman/Bruce Wayne and directed by Christopher Nolan which began in Batman Begins. The film is set 8 years after the end of The Dark Knight and the death of Harvey Dent/Two-Face. Batman has not been since the death, having agreed to take the blame for Dent's actions and death, Bruce Wayne too has been in seclusion, with only his butler Alfred Pennyworth (Michael Caine, Interstellar, Kingsman: The Secret Service, Now You See Me) seeing him. Bruce is in somewhat poor physical condition, his actions as the Batman having taken a physical toll on his body. A new villain has appeared on the scene, the masked mercenary Bane (Tom Hardy, Mad Max: Fury Road, This Means War) who is seen early in the film escaping from a plane in mid air. Wayne dons the Batman outfit once again, against Alfred's wishes as Alfred fears losing Bruce too, to confront Bane only to find that much of Gotham's police force is determined to arrest the Batman for the death of Harvey Dent, not knowing the truth behind what actually happened. Credit: http://en.wikipedia.org/wiki/File:Dark_knight_rises_poster.jpgBatman, as both Batman and Bruce Wayne, also comes across the cat burglar Selina Kyle, or Catwoman (Anne Hathaway, The Intern) a sometime associate of Bane. Bane takes Gotham hostage and severs its connections to the mainland by destroying all the bridges and in the process defeats Batman, leaving him broken. Bruce Wayne needs to recover and free Gotham from Bane's grip, but what will this cost the Batman? Gary Oldman (Dawn of the Planet of the Apes, RoboCop, Tinker, Tailor, Soldier, Spy) reprises his role as Commissioner James Gordon and Morgan Freeman returns as Lucien Fox, president of Wayne Enterprises and supplier of Batman's high-tech gadgets. A possible love interest is introduced in the character of Miranda Tate (Marion Cotillard, Contagion) and not everyone in the Gotham Police Department has lost faith in the Batman, as shown by Officer John Blake (Joseph Gordon-Levitt, Looper, Sin City: A Dame to Kill For). Bane previously appeared in the 1997 film Batman & Robin, but this portrayal of the villain is by far superior to that grunting thug. The only downside is that occasionally Bane's mask can make it slightly difficult to understand what he is saying. The contrast between Bane's physical strength and his speech mannerisms is profound, with an added edge being added by the mask. Bane is thus what appears to be a highly intelligent yet brutally physical thug. There are some deviations from what would be considered the canon of the Batman story, which may offend purists. Still, such is hardly uncommon in film adaptations of comic book superheroes. The film is full of action and some new gadgets for Batman to play with. Bane as the villainous mastermind is definitely intimidating and not a two dimensional character. Catwoman, the somewhat unscrupulous cat burglar and thief, is an interesting counterpoint to Batman's gloomy and gruff personality. All in all, The Dark Knight Rises is an excellent film and a fine conclusion to this trilogy. A direct sequel is unlikely, but some possibilities have been left open.